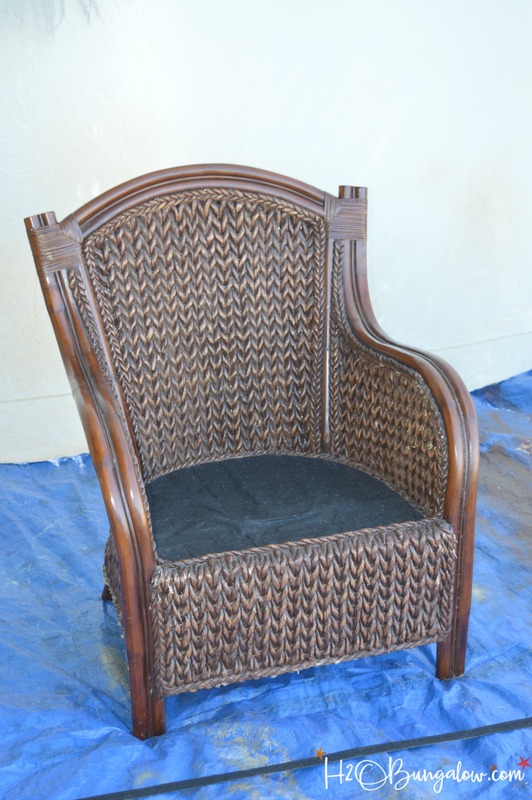 Today we are talking about how to paint wicker furniture with a paint sprayer. I confess that I’m a chicken when it comes to changing a piece of furniture I’ve loved. I procrastinate on starting a project for months just because I’m not sure how it will turn out, even though I know it will look better. Painting my rattan wicker chair was one of those projects. I stared at it for the longest time, imagining what it would like with a nice fresh coat of paint. I was was worn, dark and boring, yet I did nothing. Until HomeRight came out with their new Finish Max Extra. All the bloggers were talking about it, and I’d just got my hands on one. I knew using a paint sprayer to paint wicker was the only option if I wanted a quality paint job. Besides, can you imagine how long painting a large wicker armchair could take by hand? Me either! I finished my chair makeover in a few hours. Which was great since I was packing to leave in the morning on my drive to Vermont to start working on more DIY projects in the North House. I made a quick 3 minute video to show you how to paint wicker furniture so you could see my steps and how easy it was to use the Finish Max Extra paint sprayer. In a nutshell this is how to paint wicker furniture. Step One : Clean the wicker furniture. Remove dust and dirt with Simple Green and a clean cloth. Use a brush and hose if needed to get the woven areas clean if there’s a lot of dust build-up. Allow to dry thoroughly before moving on to the next step. Step Two : Tape off areas that you don’t want painted. 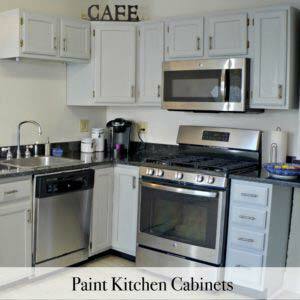 Use painters tape and a plastic drop cloth to protect any areas that won’t get painted. Plastic sheets or a garbage bag work well for wide surfaces. Step Three: Test the paint sprayer and adjust paint flow if necessary. Use an old board and spray a test pattern. It’s easy to adjust the spray flow on the Finish Max Extra with the little dial that’s located on the handle. You’ll want a nice even flow of paint that will cover your piece with one pass of the sprayer. Paint with a slow and even back and forth motion. I like to start at the bottom on a piece so I can see how the paint sprayer is coating my piece before moving on to the more visible areas. Step Five: Add finishing detail. This step is optional. 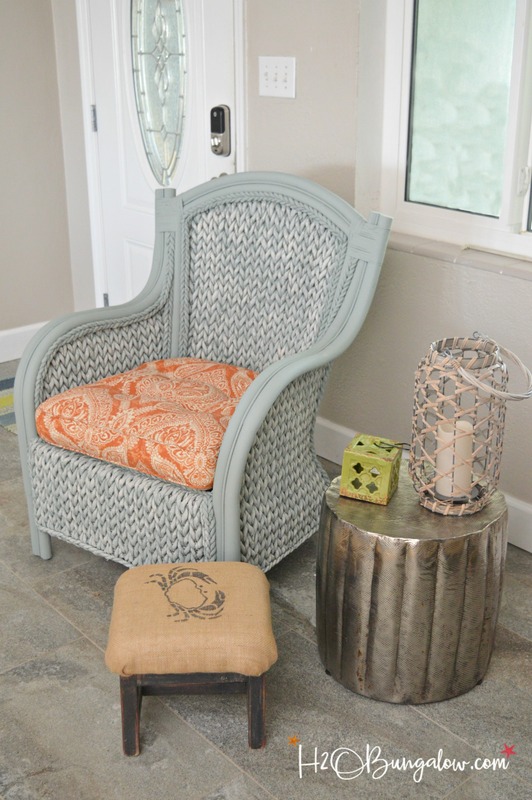 Dry brush paint in a contrasting color onto desired areas of the wicker chair for added detail. 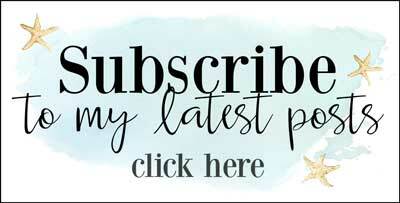 I share a great example of dry brushing in my Bakers Rack makeover tutorial. Use a clean painters rag to wipe of excess paint. Dry-brushing paint on wicker furniture looks best when the paint is not perfectly even. This step adds depth to the paint project. 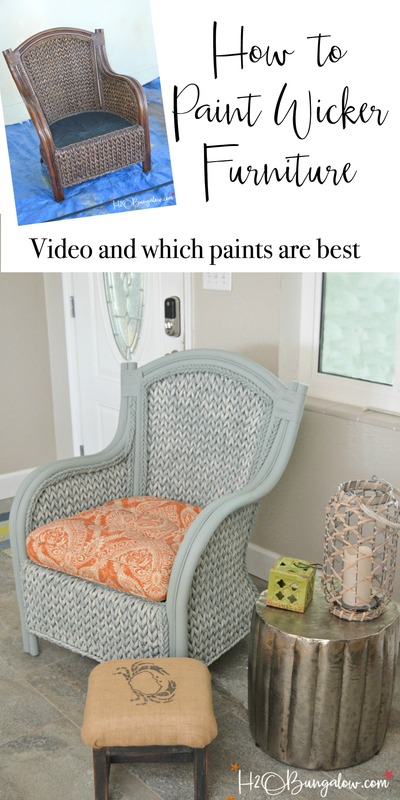 Which paints are best for painting wicker furniture? Since we are talking about how to paint wicker furniture, let’s talk about which paints work best on wicker furniture. You’ll need to use a self sealing paint. 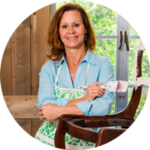 Some mineral and chalk paints need a wax coat to seal them or they will rub off. Seriously, you don’t want to try to wax wicker furniture by hand. I’d suggest painting your wicker chair with a latex paint or chalky type paint that specifically states it doesn’t need to be sealed. I used Amy Howard at Home paint in Cartouche Green to get this lovely color. It’s a dusty blue-green and will look fabulous with my contemporary coastal living room makeover I’ve been working on. What is the best way to paint wicker furniture? 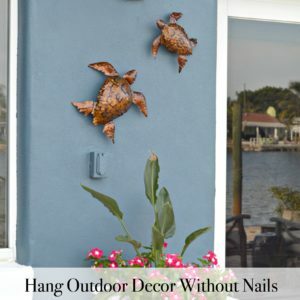 Can you use spray paint to paint wicker furniture? The answer is yes but it will cost you a fortune in paint and I don’t think you’ll come near to the quality of paint job that a paint sprayer will get you. I used about 3 cups of paint when I painted this wicker chair. Using the paint sprayer I was able to get a factory type finish with no dark wood showing through anywhere. Oh, it’s a smooth finish as well, there isn’t one drip or brush mark! What I loved about this new version of the Finish Max was that it comes with different spray tips for different types of paint. I didn’t need to thin the paint with water either. Clean-up was easy, I just ran water through the sprayer and rinsed the pieces. I would have spent the same amount of time washing out a paint brush. My painted wicker chair isn’t staying here permanently, but I liked it next to my new wall mounted TV cabinet I just built for the photos. The orange cushion will be changed for something softer but that will have to wait until I return from VT and the North House work I’m doing. All in all, I think it’s a big improvement. I’m loving this color! This post was sponsored by HomeRight. Those of you who follow my blog know how much I love HomeRight products and how often I use them. 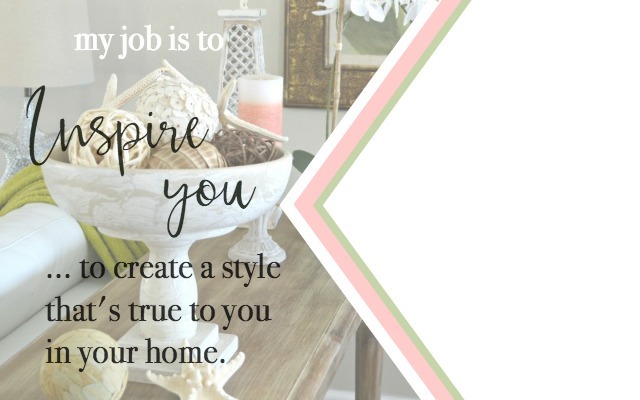 Click here to see more HomeRight projects I’ve done! 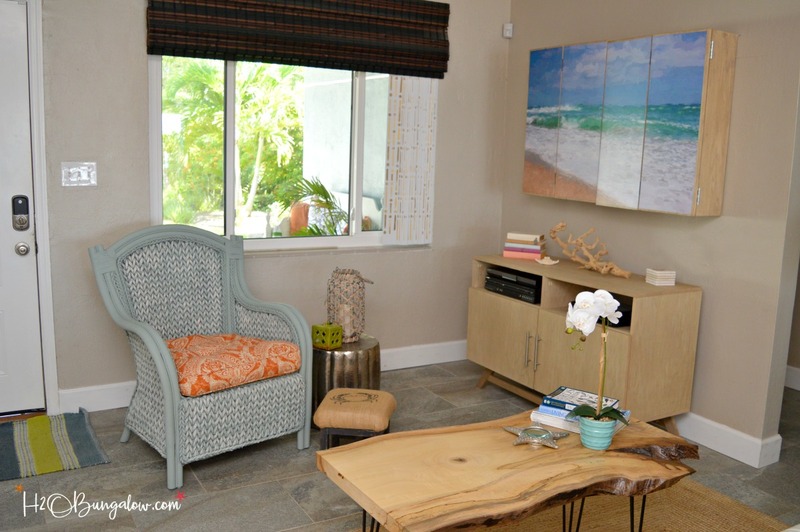 Do you have a piece of furniture that really needs a makeover? What is it? What’s holding you back? Share below in the comments section! How has the paint held up? I have two of the same chairs, and really considering this! Hi Nicole! That’s a very good question. It’s been about a year and the chair looks just as good as the day I painted it. I say go for it! You’ll be so happy you did. I loved my chair but wasn’t loving the dark brown anymore. Share a picture of your chair after you paint it! We have a weekly share thread on the H2OBungalow Facebook page, just add our photo. It’s a lot of fun and it helps other readers when they see what everyone makes:) Thanks so much for your good question and stopping by! Hi Xenia! Thanks so much for letting e know the video wasn’t working! Crazy technology, sometimes it works and other times it doesn’t. I’ve fixed it in the post if you’d like to see it now. Thanks so much for letting me know it wasn’t working! 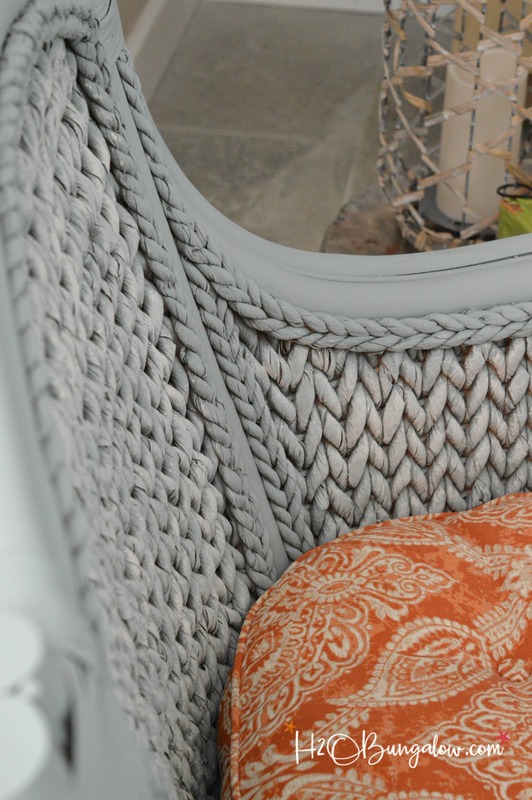 Loving the new color of the wicker chair Wendi, and Oh my! That new Homeright Finish Max Super is the bomb. I love it too! Hi Gail and thank you! 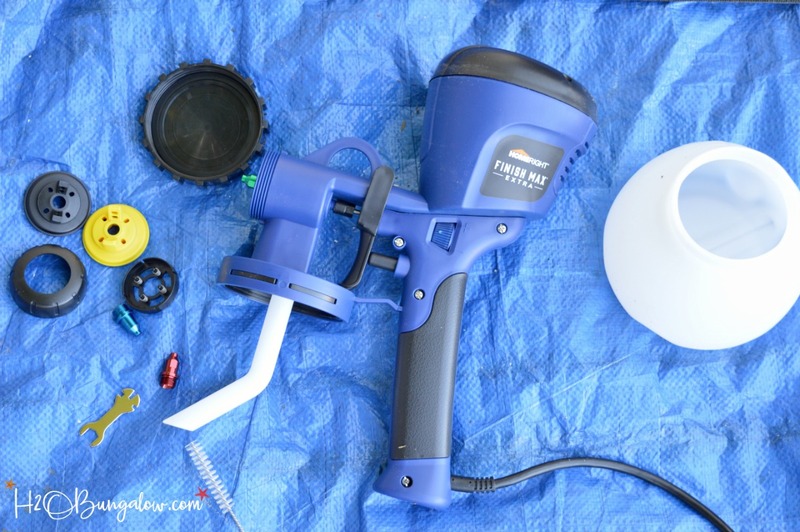 The new paint sprayer is the bomb…and more! I loved using it so much I brought it with me to VT..LOL I plan on using it a whole lot here! 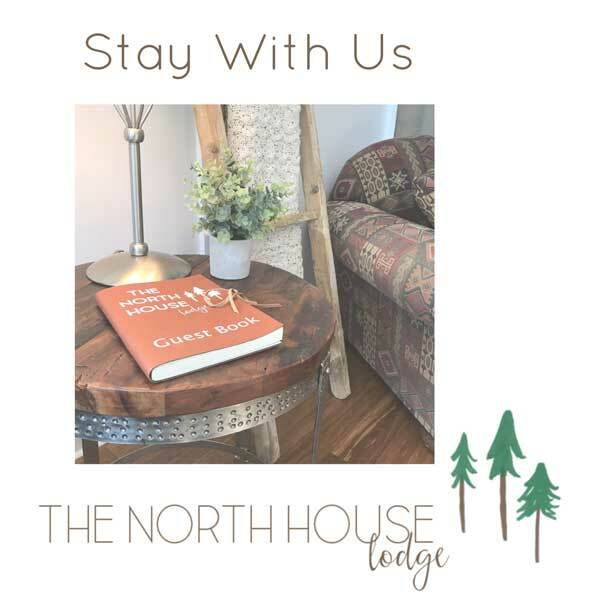 Thanks so much for your sweet note and visit! I’ve been eying up wicker chairs that look a bit like this at the thrift store and now that I have seen how yours has turned out I think I really need to go back and get one. I love the colour you used and think it looks fab! Hi Sam and thank you! I remember the beautiful sun rooms in England and if your area has them also I think a wicker chair or two would be perfect. In reality, I think a pretty painted wicker chair would look great almost anywhere. Good luck on your chair hunt. I’m sure you’ll make it look fabulous with a fresh coat of paint! 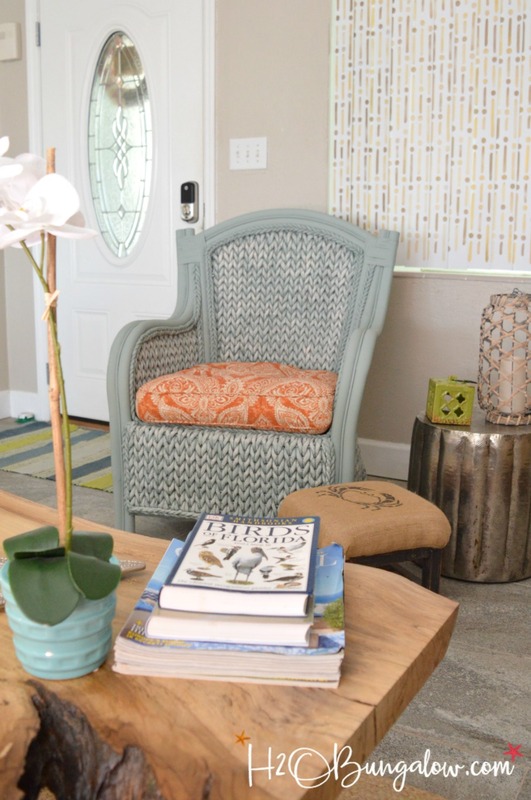 That wicker chair just looks so much more ‘you’ in the new color and I’m still loving those stenciled vertical blinds. Hi Vanessa and thank you! I think the color looks more me too. I don’t know why I took so long to get around to tackling this project?? I love the vertical blind project too, I’m thinking of doing another set for a different room. 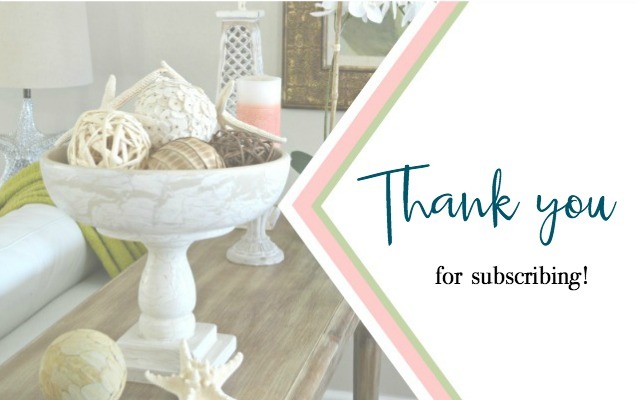 It’s on the “list”…LOL Thanks so much for your visit! Love This! Color is amazing. Another winner. Hi Deb and thank you. The color turned out better than I expected. I can’t wait to share the rest of the room makeover. Notes like yours make my day, thanks so much! Wow! That’s a knock out!,love it. Hi Debby and thank you! I love this color too. It’s a bluish-green with lots of grey in it. Definitely unique. I’d recommend the investment of a paint sprayer if you can. They dramatically changed the time and quality of some of my projects. Thanks so much for you’re thumbs up and sweet note! Hi Angie! Thank you! I love the paint color…the cushion needs to be changed out but I was on limited time. Now I’ll have to get to the side table when I get home. I’m with you on the paint sprayer, I jumped for joy the day mine arrived. I love this new one so much, I brought it to VT with me. I can’t wait to pull it out for a few makeovers!